Summary: Estimate construction costs for building a new home with a great room and vaulted ceilings in Southern California. 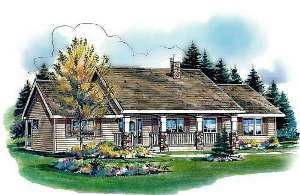 This is an attractive 4 bedroom, 2 bath ranch style house plan with a lot of nice features, yet it is only 1,412 sq. ft. The front porch measures Approx. 27’ x 6’. This plan as shown is with a full basement, but it can be easily modified for slab construction to save money or to accommodate a high water table. I estimated the cost to build with a concrete slab foundation, as that is the typical foundation in San Bernardino, California. To estimate cost, I’ll use the free cost to build calculator found on my “Getting Started” page. For input data I used “Minimum Standard Quality” for all categories, plus a zero-clearance insulated prefab metal fireplace with brick face, central heating an air conditioning (HVAC), but no garage. Using this shape for the foundation on the cost estimating software for the San Bernardino, CA area, I came up with $117,112, including a general contractor markup of $13,370. For a new house of 1,412 square feet of living space, that is an approximate cost of $83 per sq. ft. This even included allowances for homeowners insurance or builders risk insurance. You should keep in mind that the cost to build for this example, or any house plan, can vary considerably depending on the quality of materials selected, and on actual bids for labor and material. None of the cost estimates found on byoh.com include the cost of land, land development costs, local government fees, impact fees, etc.